CHICAGO (WLS) -- A neighborhood alert site said police are looking for a robber who attacked a man at gunpoint in Chicago's Ravenswood neighborhood. Crime in Wrigleyville and Boystown reports the incident occurred three blocks from Mayor Rahm Emanuel's home, near Sunnyside and Ashland, just after 7:30 p.m. Monday. The victim said three male teenagers confronted him and one had a pistol. They allegedly took his laptop, iPhone, iPod and wallet and ran off. The last "pings" from his phone were traced to southbound Lake Shore Drive. Police have not yet released information on the alleged robbery. 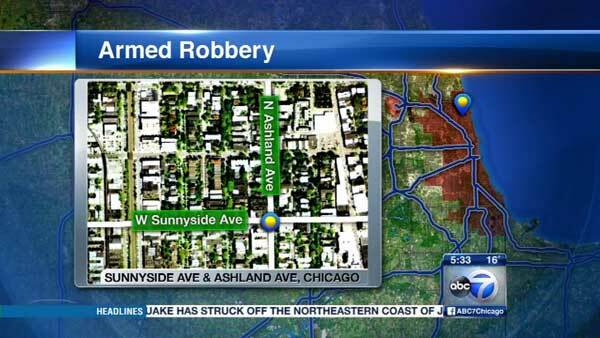 Mayor Emanuel's son was beaten and robbed near his home in December.